A great accompaniment to any curry is this healthier Peshwari Naan. To make the dough, sift the flour into a bowl and add the salt, sugar and baking powder. Make a well in the middle of the mix. Mix the milk and olive oil together and pour into the well that was made in the flour mix. Gradually stir in flour into the liquid, a little bit at a time until you have a sticky dough. Take out of bowl and put onto a floured surface and kneed for 8-10 minutes. Place the kneeded ball into a lightly oiled bowl and cover with a damp tea-towel. Leave for 15 minutes. After that, take the dough out of the bowl and tear in half. Roll each piece out, so it is fairly thin. 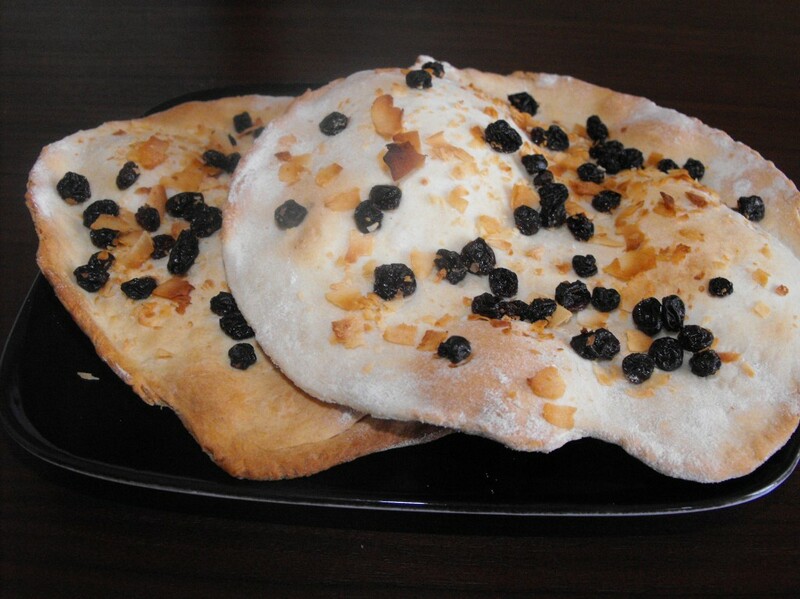 Place the naans on a baking tray and scatter over the raisins and coconut and press into the dough gently.